Making your cat like its carrier can be a pretty difficult task, right? 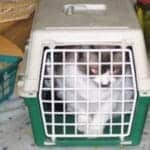 Well in this article, I am going to share some hand-picked tips on how to make a cat carrier comfortable. After following these tips, even if your cat doesn’t love the carrier, she won’t hate it! Before even trying to make the carrier comfortable, you need to buy the right carrier for your cat. Otherwise, no matter what you do, the carrier will always be a part of hell for your cat. There are many types of carriers namely hard-sided carrier, soft-sided carrier, carrier purse, carrier backpack etc. First, decide which one will suit best for you and your cat. For long journeys, I prefer hard-sided carriers. Now that you know what ‘type’ of carrier to choose, it’s time to look at the size. Size is the single most important thing when choosing a carrier. If the size is not right, no matter what you do, the carrier won’t be suitable for your cat. The carrier should have enough space so that the cat can move freely inside it. To get the right size cat carrier for your cat, first, you need to measure the length and height of your cat. To measure the length, take a tape measure and measure the length from the front of the chest to the base of the tail. For the height, measure the distance from the ground to the back of the cat. Now that you know the length of the cat, you need to get a carrier that has a length of roughly 1.5 times larger than the length of your cat. This kind of measurement ensures your cat will be able to move freely inside the carrier. Also, make sure the height of the carrier passes your cat’s height. Also look for other things such as if the carrier is well-ventilated, how secure it is, is it comfortable on its own, can the cat escape its way out of it, is it easy to carry, how much weight it has etc. Considering everything, I find this carrier to be pretty darn good whether I am traveling to the vet or a long distance with my cat. The first thing I would like to do is place a blanket inside the carrier to make it more comfortable. Now, I like to use a blanket that my cat is already using for sleeping. It will have my cat’s smell on it. The smell will make the carrier much more familiar and stress-free to the cat. Take some of your cat’s favorite toys and place them inside the carrier. You don’t need to get over the board with it. Just a couple of toys would do fine. It will make the carrier much more interesting for your cat. Also, she’ll gradually start to like being inside of it. Take notice of what your cat likes. Does she like warm places? Then place the carrier where sunlight can penetrate it. Does she like high places? Then keep the carrier in a high place where your cat can easily access it. Cats love their own smell. It is the smell that marks a space familiar or unfamiliar to a cat. I always love to keep something inside the carrier that has my cat’s smell on it. Also if you want, you can get a cat pheromone spray which will work just fine. These also come in handy if your cat gets nervous during traveling. Sometimes to lure your cat inside the carrier, you can leverage catnips or your cat’s favorite treats. This will help to create a positive association between your cat and the carrier. Also, feeding your cat inside the carrier can be another way to reinforce this positive association. 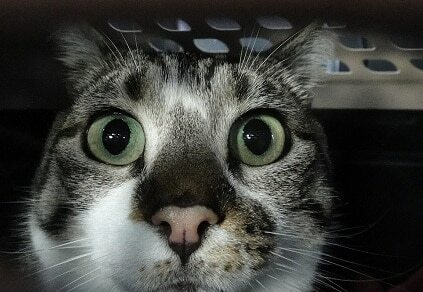 The first thing you need to do is, leave the carrier open in your home at a place where your cat goes more often. Like most cat owners do, you shouldn’t keep the carrier locked in a storage room and bring it out only 5 minutes before starting a journey. 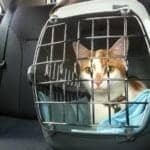 You need to make your cat get used to seeing the carrier and of course, being inside the carrier. Keep your cat’s favorite toys inside the carrier so that it passes time inside it. Always keep the door or zipper of the carrier open. 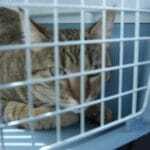 Your cat should not feel like if she goes inside the carrier, she won’t be able to come out. By keeping the door always open, the carrier will be a place of curiosity for your cat and she will eventually try to satisfy her curiosity by going inside the carrier. If your cat is inside the carrier, reward this behavior by giving her a treat. On the other hand, if the cat gets stressed out, leave the treat for the next time. Thus train your cat to be inside the carrier without being nervous. After your cat is used to being inside the carrier, it is time to take her in short practice rides. First place your cat inside the carrier. Then take it with you for a short ride around the block. See how your cat behaves. If your cat seems to be stress-free, then give her treat. If she gets nervous, don’t get upset. Just try again after a few days. This is the only way to make your cat get used to being outside in a carrier. Gradually increase the duration and distance of these practice rides. Some cats need only a few practice rides whereas you need to be much more patient with some cats. Cat carriers are not likely the place your cat will love to be inside. But they are necessary. By following the tips above, you can at least make the carrier less frightening to your cat. And if you are lucky, your cat may even start to love its carrier!